(VEN) - Deputy Prime Minister Trinh Dinh Dung recently signed Decision 219/QD-TTg approving a five-year (2016-2020) plan for production, business and investment development of Electricity of Vietnam (EVN). Under the plan, EVN will develop renewable energy sources and power projects and grids according to national and local electricity development plans, and promote environmental protection in electric power project investment, construction and operation. EVN is expected to achieve an annual commercial electricity growth of 10.08 percent in 2016-2020, operating the national power system safely and to ensure power stability and efficiency. The group will prepare to increase its commercial electricity growth further in the subsequent period. Moreover, EVN will continue restructuring its member units to develop a competitive electricity wholesale market while expanding power grids to rural, mountainous and island areas to ensure that most rural households have access to electricity by 2020. To satisfy the electricity demand up to 2020, EVN needs to put into operation 21 turbines at 12 power projects totaling 6,100MW in capacity, including key projects of the Lai Chau Hydropower Plant (put into operation in 2016), and Duyen Hai III, expanded Duyen Hai III, Vinh Tan IV, expanded Vinh Tan IV and Thai Binh I thermo-electric plants. The group also needs to construct eight power source projects totaling 5,540 MW in capacity, including expanded Yaly, expanded Hoa Binh and expanded Tri An hydropower plants, and expanded Vinh Tan IV, O Mon III, O Mon IV, Quang Trach I, and Quang Trach II thermo-electric plants. It will also prepare to build a Tan Phuoc I thermo-electric plant and approved solar power projects. EVN needs to develop about 300 500 kV and 220 kV power grid projects totaling 12,200 kilometers in length and about 66,000MVA in capacity. The group will continue to construct electric grid projects, ease overloading and congestion, improve the voltage quality and ensure that 220 kV or higher voltage power grids are available nationwide and all 110kV power grids in major cities meet N-1 standards. EVN will consider grid development cooperation with countries in the region to enhance electricity import from Laos, Cambodia, and China. 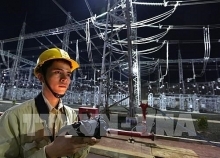 Planned projects include 500kV and 220kV transmission lines to be connected to countries’ power grids and transformer stations, AC-DC-AC conversion stations (back to back), 110kV power grids and other low to medium-voltage transmission lines.